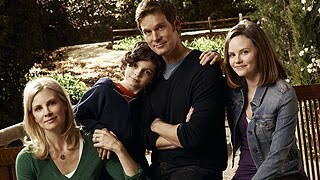 NBC’s Parenthood storyline resonates with me week after week. I haven’t enjoyed a show this much since 30 Something. I relate to this show on so many levels. For one thing, it’s about parents, and their problems and realities. For another, it’s about a family that has its ups and downs and shows that our problems are never singularly our own. You probably already know that the show follows the Braverman clan, five grown children, their families, and their aging parents. Last week the parents, Zeek and Camille, played by Bonnie Bedelia and Craig T. Nelson, shared their financial and marital issues with their kids. She has just kicked him out of the house, and he moved in with Adam and Kristina, played by Monica Potter and Peter Krause. This week problems erupted with him living under their roof as he doesn’t understand how they put up with their Autistic son, Max, and his erratic behaviors. They let him watch TV when he wants, though it’s a set time everyday, and seem to give into their every whim including running off to buy donuts when he demands he wants them. In addition, their daughter, Haddie, is on the verge of having sexual relations and he can’t understand how they are letting her get away with it. At the beginning of the season, Adam and Kristina had Max diagnosed and it’s been a gradual acceptance of their living with a child who is sometimes living in his own world. Peter Krause, in particular (who I LOVED in Six Feet Under), has really helped evolve his character’s acceptance of his son’s reality of living with Autism. This week, we could see how far he has come, as he and his wife really seem to understand their son’s structural and organization needs. When Max loses his turtle, he freaks out and his grandfather can’t see what the big deal is. But somewhere down the line, he understands that their structure and organization are holding Max together, and what a good job they are doing to keep him together. It was very touching when he told his son, Adam, at the end after finally finding the turtle, that not only he is doing a great job with Max, but it’s a far better job than he ever did with his own family. Sarah (played effortlessly by Lauren Graham with the same wit and grace she brought to Gilmore Girls) is a single mom who fiound herself out of money at the beginning of the season, and must move back home with her parents, with her two rebellious teenagers in tow. Now she is living with her mom, Camille, who after recently having kicked out her philandering, cheating husband, is back in art school. When Sarah stumbles across her all dressed to the nines one evening on her way to a gallery opening, she insists on joining her. At that monent, her father comes into the house to get something he forgot and sees his wife of over 40 years looking amazing, and you can see his heart drop. He’s clearly in love with her. However, they go to the gallery opening and Camille runs off with her art instructor and ends up sleeping with him. The recognition of this fact rattles Sarah. Graham’s eyes are so expressive and her acting so subtle and she seems to have a solid grip on playing someone so sensitive. I’m sure that Maura Tierney, who was supposed to be cast on the show before her Breast Cancer diagnosis, would have been good, too, but the role feels like it was written for Graham. Sarah’s daughter, Amber, played by Mae Whitman (who so excellently played Gabriel Byrne’s daughter on HBO’s “In Treatment”), has been uprooted from her home to come live with her mom’s parents in Berkeley. She’s going through a hard time, being in a new school and doesn’t always feel like she fits in. This week, she wakes up in a gazebo at the country club where she waits on tables, with her cousin’s ex-boyfriend, Steve, who she has clearly slept with. She tells him not to tell anyone, and then she acts tortured over the feelings he has for him. Haddie insists that she come to a sleep-over that her mother suggests she have to get over Steve, her ex-boyfriend, the one that Amber just slept with. Amber breaks down and tells Haddie about her night with Steve, sending Haddie as far away as she can. Amber implies that there’s something wrong with her to do things like that. She has issues, serious issues. Julia Braverman, played by Erika Christensen, is the youngest of the five kids and a successful lawyer. She and her husband have a little girl and he’s a stay-at-home dad. Her character struggles with the fact that she is never home for her daughter, and she is constantly trying to make compensations for it. It’s easy for any working mom to relate to this character. This week, she resolves to help solve her parents’ financial problems and asks an ex-boyfriend to come help. He’s a real estate fund manager. Her husband, Joel, can’t stand him and things are made worse when he offers to help with his own set of skills from his time as a contractor, Julia rejects his offer causing a tide in a relationship which seemed to be very solid. Lastly, there’s Crosby Braverman, played by Dax Shepard. He had a son with a woman who never told him and he missed the first part of his life. Now the boy is around 6 and he’s getting to know him and his mother, and he’s trying to work out whether he has a future with both of them or not, as he’s also falling in love with the mother of his child. This week, he seemed to be really thinking about moving in with them as he made a break from his parent’s home and learned how to do his own laundry. He goes apartment searching and makes plans to have his piano removed from his parent’s attic, which is a clear message that he’s serious on his new family. One issue that wasn’t touched on this week is the internal battle with motherhood and being a mom that each of the main characters face, except Camille. A few weeks ago Kristina, a stay-at-home mom, who clearly struggles with her decision to be home, went away to do some work for an old friend. She used to work in politics but left when she had her first baby. After just two days of work, she was offered a full-time job working on the campaign for a lieutenant governor. She was so excited about the offer and ready to jump on the wagon. But when she got home and started telling Adam about it, she realized she had to turn it down. She said her children would only be home once. She was in tears and so was I. This show can be quite realistic and heart-breaking at times. I have been in her shoes. I still am. I have also felt like Graham’s character, who at the age of 40 is trying to figure out who she is. She is now applying to universities, something her daughter convinced her to do. One week, she had an affair with an old high school sweetheart and dumped him, leaving him in Starbucks to bad mouth her with his colleagues when she left. Soon after, she is waiting on tables at an event where he is being honored as a poet. As he rambles off poem after poem, he stares at her as he reads tales of a broken heart obviously aimed at her. I also have a special needs son so that story rings a whole lot of bells. Phew. LOVE Parenthood. I feel like it is so true to life with great writing and amazing actors. I hope this show is around for a while!